Early voting at the elections of deputies of the House of Representatives of the National Assembly of the 6th convocation started on September 6 and ended on September 10, 2016. According to Art. 53 of the Electoral Code, a voter who has no opportunity to be present on the day of elections at the place of their living shall be entitled not earlier than five days before the election to come to the polling station and vote. The Code requires no official confirmation of the reasons for the impossibility of the voter to come to the polling station on Election Day. Early voting is not conducted in sanatoria, preventoria, rest homes, hospitals and other stationary medical treatment and prevention institutions, for the citizens, serving sentences in the form of arrest, as well as citizens held in activity and therapy centers (LTPs). Early voting is carried out from 10 till 14 hours on working days and from 16 till 19 on days-off in the presence of not less than two members of the precinct commission. A separate ballot box should be used bearing a seal made on the first day of early voting according to the rules established by Part 3, Art. 51 of the Electoral Code. The sealing procedure may be attended by an observer. Every day after the time of holding voting ends the chairperson or deputy chairperson of the precinct commission shall seal the slot for dropping ballot papers in the ballot box with a sheet of paper. The chairperson or deputy chairperson and a member of the precinct commission shall put their signatures on this sheet. Opening of the slot shall be done daily before the beginning of early voting by the chairperson or deputy chairperson of the precinct commission. The opening procedure may be attended by an observer. In the period of early voting daily the chairperson and deputy chairperson of the precinct commission shall compose a protocol where the number of ballots received by the precinct commission, the number of citizens who received the ballots for voting (on the last day of early voting – the total number of citizens who have received ballots for voting), the number of spoilt ballots and the number of the ballots not used shall be indicated. The protocol shall be signed by the chairperson or deputy chairperson and a member of the commission. A copy of the protocol shall be put up for general familiarization in the premises of the precinct commission. The storage of the ballot box shall be provided by the chairperson of the commission. After the closure of the polling station, the guarding of the polling station should be secured by the Ministry of Internal Affairs. The premises should be equipped with a burglar alarm controlled by the Ministry of Internal Affairs. Neither the Electoral Code nor the CEC regulations govern the storage of ballots and voter lists during the non-working hours of the election commission. The only document that regulates these matters is a collection of guidelines for the PECs, which was approved by the Central Election Commission, according to which voter lists and ballot papers in the period from 19.00 till 10.00 and from 14.00 till 16:00 hours should be stored in safes or metal cabinets. The safe (metal cabinet) should on a daily basis at the end of voting at 19.00 be sealed by the chairperson of the commission or their deputy. 364 short-term observers of the campaign Human Rights Defenders for Free Elections observed the phase of early voting throughout the five days at 182 polling stations across the country, counting the voters who took part in early voting. As a result of monitoring early voting, experts of the campaign Human Rights Defenders for Free Elections note absence of any progress in comparison with previous elections. As before, early voting was marked by administrative coercion organized by state-owned enterprises, institutions, universities and local executive authorities. In some cases, voters were forced to participate in early voting through elements of control over their participation in voting and threats of various disciplinary sanctions. This is a gross violation of the constitutional rights of citizens and the principle of free participation in the elections. It also runs counter to the international principles of free and democratic elections laid down in the Document of the Copenhagen Meeting of the Conference on the Human Dimension and the Convention on the Standards of Democratic Elections, Electoral Rights and Freedoms in the Member States of the Commonwealth of Independent States. It is also worth noting that neither the managers of businesses nor the university administrations are, according to the current electoral law, among the entities in charge of conducting the elections. Coercion to vote and the organized nature of early voting continued to be one of the key violations reported by the campaign’s observers in at least 18% of the PECs. Another common type of violation is a mismatch between the observers’ reports and the official data on the number of early voters. 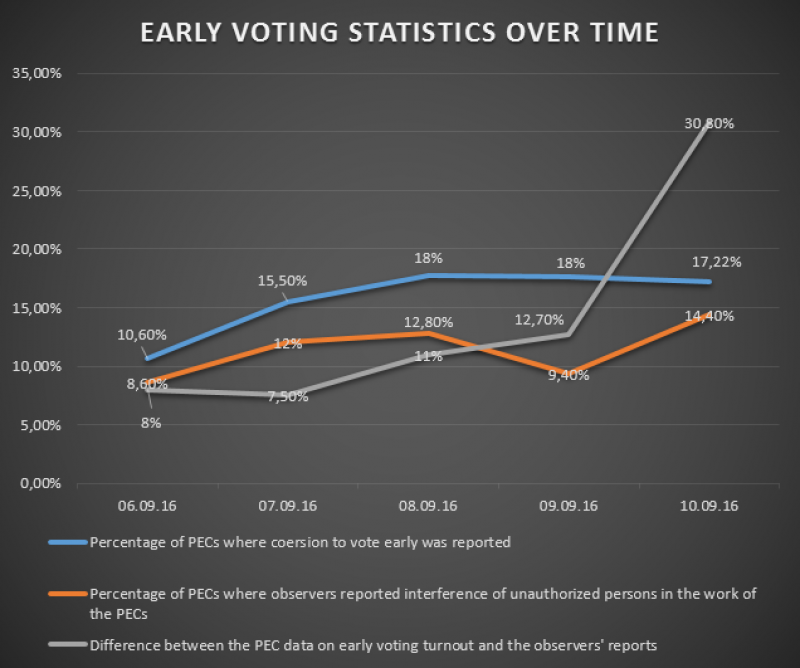 In at least 55% of the PECs, the observers witnessed such discrepancies in voter turnout. The total percentage of discrepancies in the data during the five days of early voting was a 14% overstatement. During the 2012 parliamentary elections, the total percentage of overstated turnout was 10.4%. Observers also reported facts of interference in the work of elections commissions by unauthorized persons in at least 14.44% of the PECs. 5% of the campaign’s observers encountered obstacles in the implementation of monitoring and refusals of election officials to provide information under the current electoral law. Observer Yury Belski was arbitrarily deprived of accreditation at polling station No. 28, DEC No. 27 in Polack. An observer of the public association Movement for Freedom reported ballot stuffing in the ballot box for early voting on September 10 at polling station No. 625, DEC No. 108 in Minsk. Representatives of the campaign Human Rights Defenders for Free Elections conclude that the practice of early voting remains one of the systemic problems of the country’s electoral process and creates a broader stage for various manipulation and falsification. In this regard, the OSCE ODIHR recommendations regarding changes to early voting procedures remain valid after the elections to the House of Representatives of the National Assembly of the Republic of Belarus of the 6th convocation.